Director Richard Linklater's Before films have easily become one of the best, most heartbreaking and romantic trilogies in cinematic history. Before Midnight is a far more adult entry in the series after exploring young love and life after love in the two previous films. 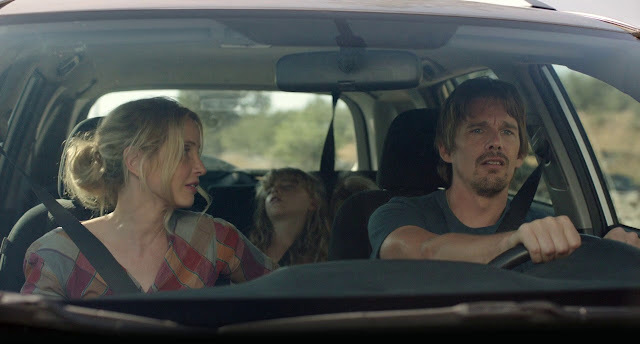 Ethan Hawke and Julie Delpy (who once again co-wrote the script with Linklater) are back as lovebirds Jesse and Celine, settling roughly into their nine-year relationship and parenthood. This third film somehow manages to be the satisfying culmination and total antithesis of everything said and promised in Before Sunrise and Before Sunset. Looking back, Before Sunrise (by the standards of its two sequels) is a fairly conventional 1990s Generation-X romantic comedy (at least in its set up). Once things get going, it reveals itself as a thoughtful, talky mediation on youth and the possibility of love. Its simple structure of strangers meeting, walking and talking on the streets of Vienna on one night and falling in love, is almost dreamlike in its youthful naïvety and charm. Nine years later, Before Sunset sets itself apart as an inventive way of continuing a story of love lost by revisiting these characters as far more practical and cynical thirty-something adults. Jesse and Celine have all sorts of emotional and relationship baggage yet just enough of their old selves. It has a near perfect introduction, revealing and building from its predecessor, and a pitch perfect ending, teasing the possibility of rekindling the past. It's a mature coda to the dreams we have about love in our twenties and a truly affecting film about life after love. Another nine years later, Before Midnight had a lot to live up to. Linklater, Hawke, and Delpy were tasked to once again revisit, reinvent, and reimagine Jesse and Celine's impossible yet universal story of love. Like we had all hoped, Jesse succumbed to his desires at the end of Before Sunset, missed his flight home, and finally got together with Celine for good. We find Jesse and Celine very much dealing with the complications and repercussions of this decision and following his heart. What makes Before Midnight so insightful is the way it explores the characters' romantic pasts and the complications of their love. Their devotion has come at a price. Jesse's first marriage has ended bitterly at the cost of seeing his son only sparingly. He and Celine have established life in Europe with two young twin daughters to care for while maintaining their delicate family life. Linklater constructs the film with a series of long single takes of our characters talking in real-time. Even more conventionally cut scenes are long and build a conversational momentum that is more thrilling and engrossing than most action films. We visit them on the last day of their Greek vacation, saying goodbye to Jesse's visiting son from his first marriage, juggling their careers, and reinvigorating a romance that's seen its better days. Linklater's shooting style, framed around the gorgeous backdrops of Greece, is breathtaking in its construction and parallels to the couple's relationship. It's an affecting film about the tensions and fragile nature of attaining and maintaining true love. As the film's subject matter grows darker and darker, we move to more confined, insular settings, building tension through dialogue. The dramatic premise of a ticking clock or a deadline of the first two films is replaced here with dramatic history. The couple recounts the struggles in their relationship over the last few years after spending only two single days together many years apart in those first nine years. Hawke and Delpy are so raw, honest, and visceral in their performances, executing their lines and blocking thoughtfully and naturally. As Jesse and Celine, they show us how difficult true love really is, by going to dark places emotionally. Before Midnight is a moving, bittersweet tale of, not only love and life, but what comes after both. Linklater tells a story of romance where love itself has become the obstacle to overcome, bigger and more threatening than time and distance.